I ran sport fishing charter boats on the gulf coast from Florida to Texas for almost 30 years. Two years ago I had a hip replaced and suffered severe nerve damage during the surgery so now, at least for another year or two, I can't walk very well and I can't do my job on the water...which is not only putting folks on fish but keeping them safe. Since I cannot return to the sea I fell back on a trade I learned about 40 years ago when I didn't have the patience to appreciate or use what I learned....lol. Silversmithing. I have found that I actually enjoy designing and making sterling silver and semi-precious gemstone jewelry. When I was 20 it was BORING!!! LOL I hope you like my work! Everything is genuine. I use no fake, dyed, or "treated" stones unless clearly stated in the title as well as the description. BEWARE OF FAKES FROM THE FAR EAST! THEY ARE EVEN "CREATING" LARIMAR NOW AND MOST DO NOT TELL YOU IT IS NOT REAL!! Caribbean Larimar from the Dominican Republic has been my focus since the day I first saw this amazing stone. I still make other stuff...when I have to....but this unique and rare blue stone has captured my attention. It is absolutely amazingly beautiful! Those in the know say that this is the blue stone with extraordinary healing powers that Edgar Casey predicted would be found in the Caribbean near where he claimed the Lost City of Atlantis could be found. I hope you like it as much as I do! Once in a while I find other vintage things to add to my "shop" but mostly it will be jewelry. I try to price everything as reasonably as possible considering the condition, quality and size of the gemstones and the intricacy of the silver work. INCREDIBLE NEW BATCH OF EXCLUSIVELY DESIGNED AND CREATED LARIMAR JEWELRY WILL BE LISTED THROUGHOUT THE MONTH. CHECK BACK FREQUENTLY TO SEE NEW PIECES! AAA GRADE GENUINE CARIBBEAN LARIMAR/.925 STERLING SILVER JEWELRY AT BELOW WHOLESALE PRICES!!!! SATISFACTION 100% GUARANTEED!! READ MY REVIEWS! I PERSONALLY HAND SELECT THE RAW ORE AT THE LOS CHUPADEROS MINE IN THE D.R. STILL, ONLY ABOUT 5% OF THIS HAND SELECTED ORE MEETS THE STANDARDS I REQUIRE FOR MY JEWELRY. FREE STERLING SILVER CHAIN WITH ANY LARIMAR PENDANT...ALWAYS! I TRULY APPRECIATE YOUR BUSINESS AND HOPE TO BUILD STRONG RELATIONSHIPS WITH MY CUSTOMERS. I WANT YOU TO BE 100% HAPPY WITH ANYTHING AND EVERYTHING YOU PURCHASE FROM SIMI COLLECTABLES. THIS IS A GUARANTEE! IF FOR ANY REASON YOU ARE EVER NOT FULLY SATISFIED WITH MY PRODUCT AND/OR SERVICE JUST LET ME KNOW. I WILL EITHER FIX THE PROBLEM OR REFUND 100% OF YOUR MONEY...INCLUDING RETURN SHIPPING! THANK YOU ALL FOR LOOKING AT MY STUFF AND HOPEFULLY YOU WILL BECOME ANOTHER SATISFIED SIMI COLLECTABLES PATRON! PLEASE TAKE A MOMENT TO READ SOME OF MY REVIEWS. Kirsten down in Texas says, "Just amazing. I ordered these for my mom for her 60th birthday and they're gorgeous. Not only did my shipment arrive on time, but when I told Steve that I needed it within a week he ensured that it arrived by choosing priority mail. If I ever need any more Larimar, his shop is where I'm going to." 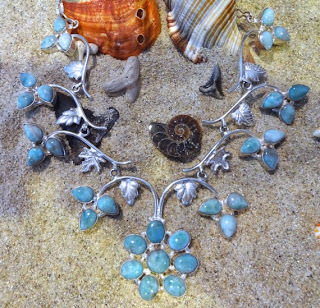 Vanessa from Fort Wayne says, "This necklace is the most amazing thing I have in my Larimar collection. It suits me well! The angel wings are magnificent and the whole thing just pops! It's an eye catcher for sure! Nothing but props to Steve! His creations are nothing less than fabulous! I love it! :D"
Vanessa (another order) says this time, "This larimar necklace is beyond exquisite.. I don't ever want to take it off! The stones are beautiful; definite quality.. I can tell Steve really takes pride in his work and he should! It is simply amazing! I will be ordering more of these beautiful items very soon." (and she did!) THANK YOU VANESSA! Buddy K. says, "Beautiful stones, beautiful necklace. Exceeded our expectations.. Only thing better was Steve, the seller at Simi Collectables - friendly, helpful with info as to the necklace's specs, he keep us informed, shipped same day, provided tracking, and genuinely wanted to know we were satisfied with the transaction through every step. Will recommend, will do business again. Thanks, Steve!" Nicole P., "Amazing service!! I am so impressed by this seller. I've purchased a lot from etsy and this is my best experience to date. The product is awesome, delivery fast and customer service is amazing. I wish i could give more than 5 stars! Thank you so much!!". Please browse my shop and I'm sure you will find something for yourself and/or a friend or relative.